If you don't have an infographic resume, you may be missing out on chance to prove to hiring managers just how creatively you can think. With millions of job seekers submitting resumes online, it can be hard to make yours stand out. So what if you told your career story in bright colors, charts and pictures instead of just plain old black-and-white words like everybody else? Yep, that's a thing. And an increasingly popular thing thanks to our data-obsessed culture. The snippet at right is a real example (thanks, Stuart, for sharing!). Pretty awesome right? 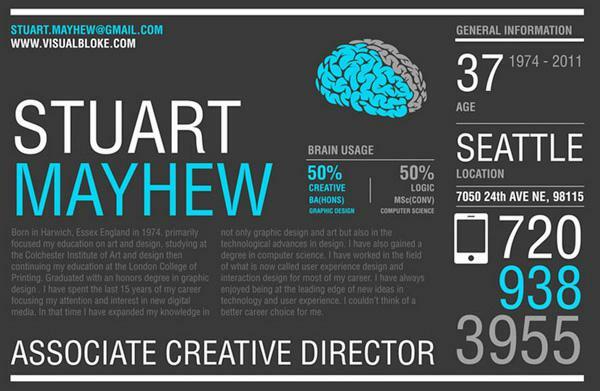 You can see Stuart's full C.V., plus 10 other stunning examples of infographic resumes here. As these creative pros know, a visual representation of your “work self” can be a fantastic way to get noticed. In fact, it may just be a better way to get your message across, depending upon the person on the other side of the desk. Before you toss your standard C.V., here are a few tips to make the most of a visual resume. You're most likely to see infographic resumes in fields like marketing, design, data analysis, and communications, which makes sense. If you're a graphic designer or a data analyst, a visual resume is a slam dunk: It shows hiring managers that you live your work and gives them a taste of what you could do for them. But what if you’re in a less creative or data-driven field? Will a visual resume turn employers off? Not necessarily. “I did a survey of recruiters and asked if they would be open to seeing an infographic resume," says Morgan. "The majority said they would love to see one. It’s like flipping through a magazine, and all of a sudden you see a pretty picture. Job seekers have very little to lose in trying something creative." A great example of this is this disaster recovery service professional’s visual resume, which does a fantastic job highlighting the job seeker’s skills at a glance. Certain facts lend themselves better to graphical interpretation than others. Did you boost profits last year and have the numbers to prove it? Show it. Have you invested 1000 hours in specialized training? Call that out. For examples of how other people visualize job skills and accomplishments, check out Morgan’s Pinterest page or the resume samples Monster picked out. You might figure that you'd need to be a Photoshop or Powerpoint guru to create a great visual resume. It's true that “if you don’t have great design skills, your infographic resume could look really wrong,” says Morgan. But some creative people have created plug-and-play resumes that do the design work for you. “Templates are great because someone has already done the work to make it have good bones,” says Morgan. Check out sites like Pictocv.com, Resumup.com and Kinzaa.com for inspiration. Re.vu will help you turn your LinkedIn profile into an infographic. You could also hire someone to create one from scratch at 99designs.com or Fiverr.com. It will cost more, but you’ll get a unique design you can call your own. Applicant tracking systems—the computer programs that allow you to submit job applications online —are here to stay. The software allows HR people to sift through candidates, searching for keywords and the “right” fit. Those tools can’t read PDFs or image files generated by programs such as Illustrator and Photoshop, and those are the formats in which you'll likely save a visual resume. So make sure you still have a trusty old MS Word resume with the same information on it to use when you’re applying online; you still need it to get your foot into the proverbial door. To use an infographic resume as the self-marketing tool that it is, you’ve got to work a little harder to get it seen. So once you've sent in your standard res through the online channels, dig up contact info for the hiring manager and send your creative resume directly. Through a little online sleuthing—either looking through the company's online directory or via LinkedIn or Google—you can probably find an email address for the person who leads the department you want to work in. It's worth the extra effort to get your masterpiece into the hands of the person you really want to impress—your next boss. Julia Gaynor is a staff writer for Monster.